The WHO (World Health Organization) estimates that one third of humanity is a victim of water stress, nearly 2 billion people who survive on less than 5 liters of water per day, and even half in some areas of Africa and the Middle East. Marc Parent came up with the idea of a wind turbine that produces drinking water when he lived in the Caribbean island of St Barthelemy, because water was scarce and expensive. 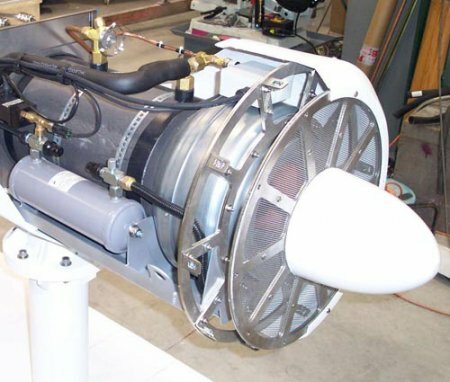 He started by collecting water produced by an air conditioning unit for his own needs, then he moved on to the idea of designing a machine capable of producing water and he combined this process with a wind turbine. This led to a completely independent device for producing electricity and water. In 2004, Marc Parent decided to found the company “Eole Tech." It was a design firm with a small workshop, which aimed to develop the very first prototypes of this new technology. After four years of work, Marc Parent completed the development of his model WMS50 (Water Maker System). He then decided to create “Eole Water SAS “. One year later, thanks to the French venture capital equity, a design for a new wind turbine, the WMS1000, was launched with the goal of producing 1000 liters of water per day. The cost of this development represented €2 million. Based in Sainte Tulle (04) since the beginning, Eole Water continues to maintain its position as a world leader in the field of wind or solar-powered condensed water production. After more than 18 months of development and testing in France, the WMS1000, the world's first wind turbine able to produce 1000 liters of water a day from air condensation, was shipped to Abu Dhabi for its first phase of tests in the extreme weather conditions of Middle East. The company Eole Water SAS, located in the south of France, is a leading global company in the field of wind power generation systems by water condensation. The process developed by the company is totally eco-friendly and allows production of natural water without impact on the environment, as well as the joint production of electricity. In environmental terms, this technology does not emit any CO2, does not require drilling, produces no discharges of desalination, does not require any electrical connection and additionally provides 30 kilowatts of electricity per day. Photographie publiée sur notre site avec l’aimable autorisation d’Eole Water, reproduction interdite. Photograph published on our site with courtesy of Eole Water, reproduction prohibited. The earth's atmosphere is packed with moisture. It is a huge freshwater reserve: 13000km3. Eole Water has created an innovative technology which is able to turn this moisture into drinking water. This is done using a condenser with a moisture exchange surface which is one meter wide and five kilometers long. It is equipped with a revolutionary "food safe" stainless steel quality alloy, especially adapted to producing drinking water. It can sustain the water creation process for decades, without risk of corrosion. The water then flows through a five-tier water treatment system, including an ultraviolet filter, in order to make it perfectly safe to drink. 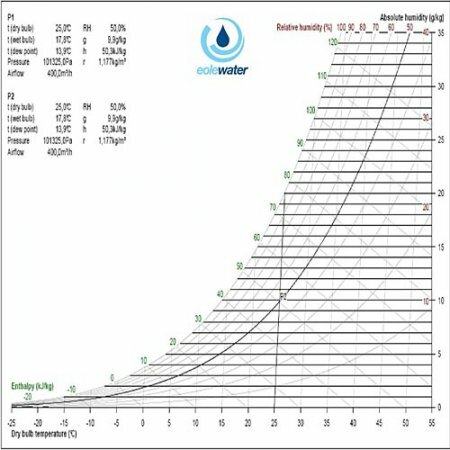 The quality of water collected exceeds the drinking water standards required by the World Health Organization. The water production machine can collect up to 1500 liters of water a day depending on the climate. This new technology is strongly influenced by the principles of sustainable development, with air, wind or sun being the only consumables. There is no CO² released, no groundwater drilling or water surface pumping. Le vent entraine les pales de l'éolienne situées sur la face avant. L'arbre horizontal qui porte les pales entraine la rotation d'un générateur électrique qui produit du courant et en partie arrière une turbine qui aspire l'air humide. L'air humide est traité par un groupe froid qui réfrigère l'air à une température suffisamment basse pour extraire l'eau par condensation. L'eau après passage dans trois filtres de purification est reminéralisée. L'eau répond aux qualités OMS pour l'eau potable. L'eau reccueillie est ensuite canalisée le long du mât et stockée dans un réservoir de stockage. Vue de l'entrée d'air en face arrière et du condenseur d'humidité. The completion of the fifth generation of air condensation water production systems enabled Eole Water to develop a range of products adapted to customer requirements: water production, energy independence, low maintenance, logistical flexibility, no environmental impact. Each part has been carefully designed to ensure that Eole Water’s products are the strongest and most innovative today. Unlike wells or boreholes, water is always present in the air. The constraint has been to design a reliable technology able to create and collect the water. Thanks to its technical expertise and its high quality components, the WMS1000 wind turbine allows people living in remote areas to benefit from access to safe water for a period of twenty years. The device is capable of producing up to 1,200 liters of water a day. The WMS1000 Wind Turbine has been designed to produce water without any external power source. Wind is the only energy used. With an installed capacity of 30kW and using air as a source of water, the WMS1000 Wind Turbine is perfectly adapted to supplying remote areas completely devoid of any existing infrastructure. 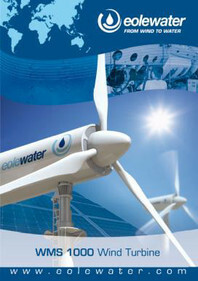 Eole Water wanted to offer an innovative technology in line with present-day sustainable development requirements. Wind power is the only source of energy needed to run the water production turbines. No CO2 is released, not groundwater or surface water is pumped. The environmental impact is practically nil. Always at the forefront of innovation, Eole Water has developed a reliable and efficient solution to growing demand: a solar-powered water production device. 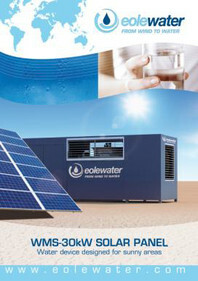 The WMS-30kW Solar Panel has been designed with this ambition: to produce water only from the sun. No electrical grid is needed: it is the most suitable technology for areas where the main resource is natural and constant exposure to the sun and which suffer from water scarcity. Operating with a clean energy source, the WMS-30kW Solar Panel is fully self-sufficient. It can be installed anywhere, thanks to its 20’ container size, and its components have been selected to ensure easy maintenance. Some remote areas require more water than energy. Based on this observation, Eole Water decided to develop a technology designed to provide water to areas already benefiting from a stable and reliable energy source. This led to the development of the WMS-30kW Grid Tie, which focuses on what is essential: water production. 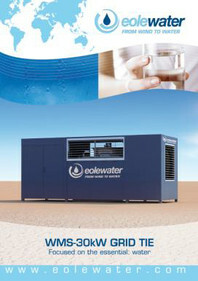 Connected to an electrical network, or to a generator, this solution offers a high and constant level of water production, 24 hours a day, whilst complying with a high energy efficiency. With a 20’ container size, the WMS-30kW Grid Tie can be shipped at low cost and does not need any heavy lifting equipment for its installation. The proven quality of its components and the carefully designed ergonomic interior help to reduce and facilitate maintenance operations. New model in Eole Water’s range of products, NERIOS S3 has a rated power of 3 kW and is thus smaller than the previous designed models. 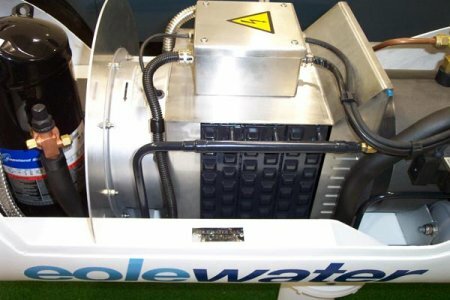 Totally self-sufficient thanks to the use of solar energy, this machine has the particularity to be equipped with an innovative ice-storage system allowing to postpone water production at the more efficient hours of the day, when the air is the most packed with moisture. The ice-storage system, by limiting the use of traditional batteries, makes the machine even greener and contributes to extend its lifetime. With a small size, NERIOS S3 was designed to require as little maintenance as possible : it can be installed and moved easily. The machine is delivered ready to use. It requires only 28 solar panels, that is to say a surface equivalent to about 45 m². Its way of working has been simplified to the maximum to allow a quick handling of the machine. 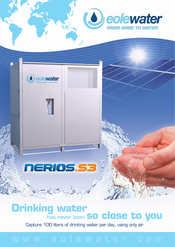 NERIOS S3, with a daily capacity of 100 L, is our compact and all terrain model. It suits numerous different uses. Whether civil or military, it is for sure the ideal model in case of emergency. It can also meet the needs of those who are looking for an autonomous water production system which is economical, eco-friendly and user-friendly. Eole Water has designed a revolutionnary wind turbine, the WMS1000 which is able to create drinkable water only by using air. The turbine is fully self-sufficient, featuring the most eco-friendly water production system ever designed. Discover this turbine in operation.